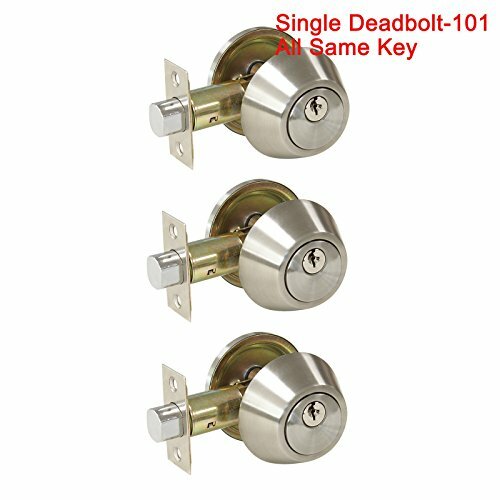 Home Building Store Provide Entrance(Same Key)/Entrance(Not Same Key)/Privacy/Passage/Dummy/Single Deadbolt/Double Deadbolt Door hardware,please contact us if you need . Great quality and high security: Conformed with ANSI Grade 3 Exceeds 200,000 cyles and 5 pins brass tumbler cylinder;Package include Selected locksets Installation Screws; Installation Instructions. Adjustable Latch with Backset: 60mm(2-3/8") or 70mm (2-3/4 '');Fit all doors 35 to 45 mm ( 1-3/8 '' to 1-3/4 '')thick,Notice: The latch plate is square, and can't removable. 5 pins pick resistant brass cylinder;brass key nickel plated;Solid Column security bolt for anti-sawing protection. If you have any questions about this product by Probrico, contact us by completing and submitting the form below. If you are looking for a specif part number, please include it with your message.